Join members of the Joint Working Group on Issues and Awareness (comprised of representatives from CoSA, NAGARA, RAAC, and SAA), for this informative webinar designed to prepare individuals with the information, tools, and messaging necessary to have successful District Congressional Offices visits. DESCRIPTION: Archives are often easy targets for losing federal funding and assistance - but it doesn’t need to be that way! 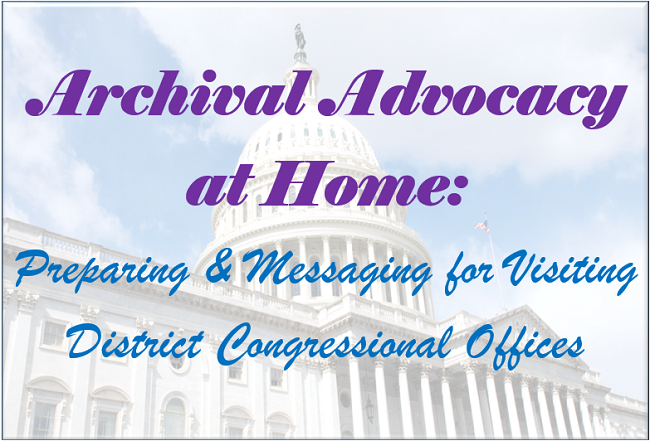 Many times, simply advocating for and educating your elected representatives and their staff about the vital role of archives and the value of archival collections can turn ambivalence or hostility into loyal support! A recording of this webinar will be available on CoSA’s YouTube channel, SAA’s online course portal (see “On-Demand Events), and NAGARA’s Advocacy Page.